Building good services takes a lot of effort. Whether it’s gaining a deep understanding of user needs, or changing policy and laws to remove complexity, or piecing together technology to make it all work, there are many things that need to be done. The most successful teams and services are those that have the space to just get on and deliver. Organisations that create an environment and culture that supports delivery will find they build better services and have more productive teams. Having the right people in the team is fundamental. A good team has all the skills necessary to get the thing done. Whether that’s developers, researchers, policy and legal experts, they all need to be part of the team. Teams should work together on a daily basis and communicate with each other throughout the day. All too often I’ve seen projects struggling to get access to the information they need because essential people are based outside the team or off working in their own silos. If you’ve got an ‘architecture team’ off in a corner doing their own thing, you’re doing it wrong. If you need to send documentation off to a security person to be signed off, you’re doing it wrong. If you have ‘policy’ teams handing down pre-agreed changes to product teams, you’re doing it wrong. Having a multi-disciplinary team comprised of all the skills a product needs means you can make decisions faster because you have everyone you need already there. You can make better decisions because everyone is involved on a day-to-day basis and can see why changes are needed. You can make a better product because everyone can see the impact a change will have on the end-thing. Trust teams to make the right decisions for their services. The people in service teams are the ones who know their users best. They know how everything works. They know where the pain points are. They are the best placed to make decisions. I’ve lost count of the number of times I’ve seen teams who know how to make their thing better, but can’t, because they have to wait for a committee to agree the change. 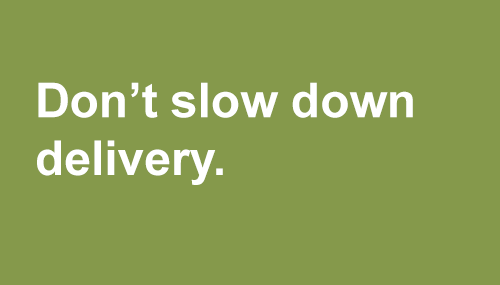 Fortnightly, monthly or even less frequent programme or change boards just slow down delivery. If a team has to go to a board for product decisions, they’ll have to do more up-front planning, which means they’ll have to start preparing decisions earlier, which increases the chance that the decision will be wrong. I once came across a team that had to send their plan for beta for a decision three months before the alpha had even started. Bonkers. Programme and change boards take decisions away from the people who know the service and puts them in the hands of people who don’t. All too often the boards are comprised of people who should actually be in the team on a day-to-day basis. For every paper or presentation a team has to write for a board, that’s time taken away from delivering a better product. I could write a novel on how to do light-weight governance well, but many other people have written it better than I could. You should go read them. There isn’t much point putting together a fantastic multi-disciplinary team and giving them the power to make decisions if they don’t have the right tools to get things done. I’ve come across too many teams who struggle to do things because they’ve been let down by the tools they’re given. Laptops that take 30 minutes to switch on in the morning, or have to be plugged into a physical network cable. Development environments without internet connections. Firewalls which block access to collaborative tools. No ability to make video calls. Internet Explorer 6. This sort of stuff is just unacceptable. Fix the basics. Teams should be able to access the tools they need to do their job well. Whether that’s Slack, Trello or wifi that doesn’t slow to a crawl at lunchtime. This extends beyond to technology to the physical space for the team. If the team needs whiteboards or wall space for a kanban wall, give it to them. If they need large TV screens for displaying dashboards, they should have them. If they need break-out space for conversations, just do it. If you want to build good services, the best thing you can do is build a good team, give them the tools they need and then get out of the way and let them get on with it. The best services I’ve worked on have done this. Some of the worst have suffered from one or all of these issues. This is the first in a series about lessons I’ve learnt about delivering good services. See the full list.